Do you want to kill a spy, and make it look like Putin ordered it. Then you will be happy to know that United Nuclear will sell you 0.1uCi of Polonium 210 for $69.00. And as their website indicates No NRC license required! 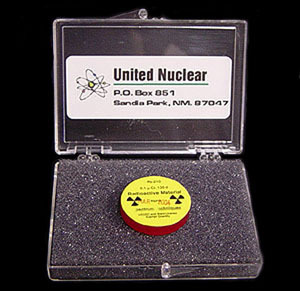 All our radioactive isotopes are legal to purchase & own by the general public. To ensure the longest half-life possible, we do NOT keep isotopes in stock. All isotopes are produced fresh in a Nuclear Reactor and shipped directly to you from the NRC licensed isotope manufacturer. - SORRY, NO INTERNATIONAL SALES OF RADIOACTIVE ISOTOPES - We can only ship isotopes to addresses within the United States. You are not restricted to just Alpha emitters like Polonium210. They also sell Gamma sources like Cadmium109, Barium133, Cobalt57, Manganese54, Sodium22, or Zinc65, and Beta sources like Strontium90 and Thallium204 (which they first thought was used to kill Alexander Litvinenko), and Multiple radiation emitters like Cesium137 (1uCi, 1=5uCi, or 10uCi) or Cobalt60, and you can get a 3 disk set of Alpha, Beta & Gamma sources. The ideal Christmas present for someone who thinks he has everything. A three disk set for only 175 bucks! what a deal! this is just the shopping site for some terrorist or unstable teenager. Aw, poor piddle puppies askeered of a little radiation? A whole microcurie of Po210 is enough to kill, ummm let me see, one adult, but only if he eats it? For $69? Hell, for $69 I'll milk a couple rattlers for ya, or round up a jar of Rocky Mountain spotted ticks. Say, fer $175 I might even be able to set you up with some gin-yew-wine Four Corners field mouse excrement all loaded up with hantavirus. Seriously, with your attitude we might as well call for all the hardware stores to be shut down because they sell shovels, and somebody might get their eye put out. We are degenerating into a nation of complete whinging ninnies who experience vicarious orgasms of panic every time Greta von Susteren frantically emotes over the horror (the HORROR! )of some completely irrelevant sideshow. Focus, people. Focus. There are much larger things at stake than retroactively worrying about where somebody could buy a microcurie of radioactive source. PS: 9mm is still under 12 cents a round. If'n you don't require any subtlety, that is. $69 will buy you quite a hatful. Just sayin'. Hmm. They're only selling one microCurie. Wikipedia indicates that you need to eat 200 microCuries or inhale 40 microCuries in order to deliver a killing dose. Therefore, you need to purchase $13,800 worth of samples from this site, grind them up and dissolve them in wine and get victim to drink it realtively quickly after you receive it, since in 138 days, you'll only have 100 microCuries and you'll need to buy some more. Oh, and be careful as you play with it, because it's just as deadly to you. There's got to be an easier way. you need to purchase $13,800 worth of samples from this site.... There's got to be an easier way. Did the Pope threaten a Muslim?